The more than 120 state parks in Pennsylvania each offer fantastic beauty and history. However, if you are looking for a Pennsylvania state park with waterfalls, it can be hard to figure out where to go. 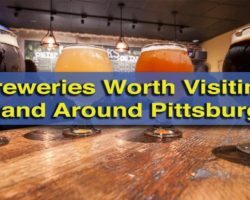 Having visited many of Pennsylvania’s state parks, including all the ones listed below, I decided to put together my list of the best PA state parks for waterfall lovers. 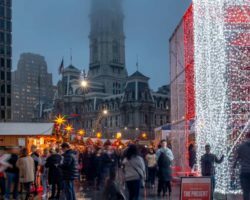 While there are certainly many more parks in Pennsylvania with waterfalls, I’ve picked out, in no particular order, the nine best state parks in Pennsylvania to see waterfalls. 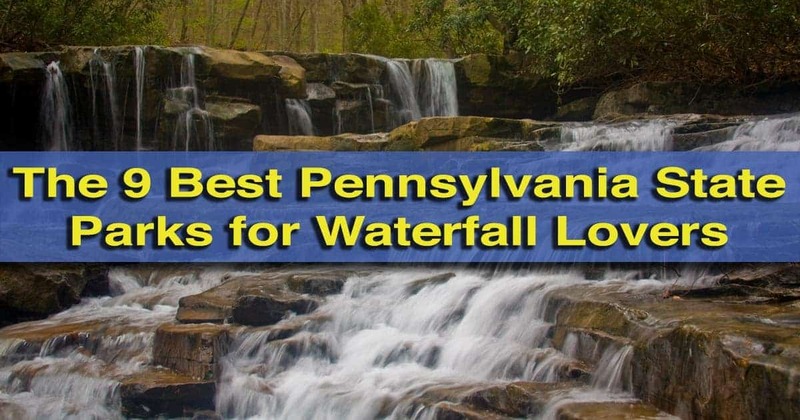 See even more of Pennsylvania’s best waterfalls on our PA Waterfalls page. One of 22 named waterfalls at Ricketts Glen State Park. 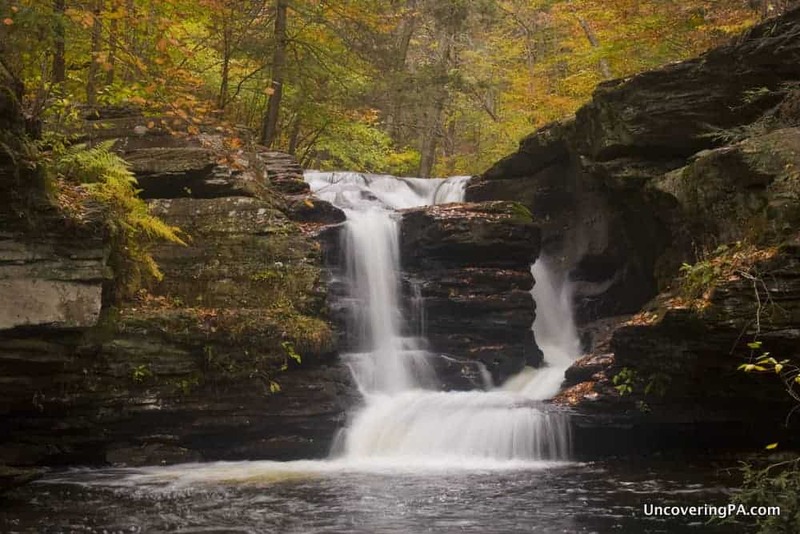 So, I just said that these were in no particular order, but there’s really no doubt that Ricketts Glen State Park in northeastern PA is the best Pennsylvania State Park for waterfall lovers. Officially home to 22 waterfalls, though some sources list more, the park offers more waterfalls than any other in Pennsylvania. Visitors can hike the Falls Trail to see nearly all of these waterfalls. Depending on the way you go, the hike is between 4.7 and 7.2 miles in length and allows visitors to see the majestic beauty of this park. 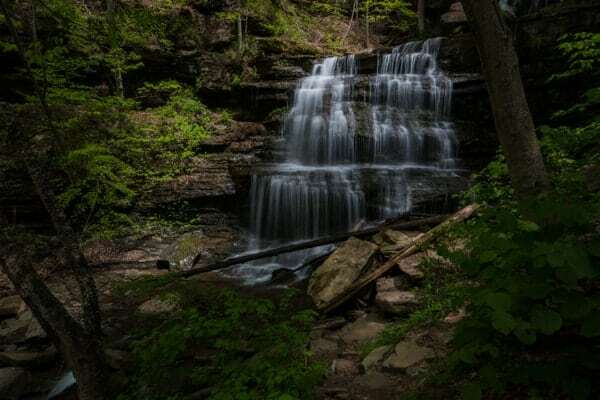 I’ve written five articles about the park, but the best places to start is with my tips for hiking the Falls Trail at Ricketts Glen. One of the waterfalls in Leonard Harrison State Park. Leonard Harrison State Park is one of two parks that straddle opposite sides of the Pennsylvania Grand Canyon in Tioga County. While both are home to waterfalls, the ones on the eastern rim in Leonard Harrison State Park deserve inclusion on this list. There are three waterfalls to be found along the Turkey Path, a steep one-mile trail that descends from the rim to the floor of the canyon. Visitors can views these great waterfalls from several viewing platforms. For more information on seeing these waterfalls, check out my piece on the parks of the Pennsylvania Grand Canyon. Hickory Run State Park is located on the western edges of the Poconos and is one of the best PA state parks for hiking, offering visitors miles of hiking trails, a fantastic boulder field, and several great waterfalls. Officially, the park’s only waterfall is Hawk Falls, which can be found down a half-mile trail in the southeastern corner of the park. This beautiful waterfall drops about 20 feet over a single drop, with another small drop just downstream. There are two other spots worth checking out in the park if you love waterfalls. Just below Saylorsville Dam, Hickory Run has several drops. While the first of these is likely man-made, it has the appearance of a natural waterfall. There are also several small man-made drops just across the road from the park office. The setting here is quite scenic with a small chapel sitting across from the falls. For more information, check out our piece on Hawk Falls in Hickory Run State Park. Hell’s Hollow Falls is one of several waterfalls in McConnells Mill State Park. Located an hour north of Pittsburgh, McConnells Mill State Park is a fantastic destination for waterfalls in western Pennsylvania. This park is primarily known for its history mill and covered bridge, which are both located next to a beautiful man-made waterfall, but there are a handful of other waterfalls scattered throughout the park. The most popular of these is Hell’s Hollow Falls in the park’s northwestern corner. 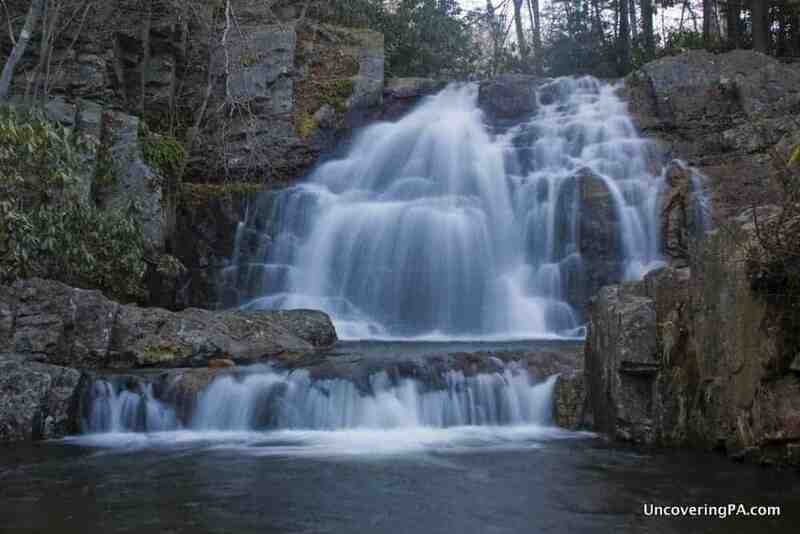 This waterfall is located along a beautiful path and is next to the ruins of an iron furnace. The park is also home to Alpha Falls and Kildoo Falls, which are on the map, as well as Breakneck Falls and Grindstone Falls, which are not. The lower half of Buttermilk Falls in Lehigh Gorge State Park. Lehigh Gorge State Park is a narrow park along the Lehigh River near Jim Thorpe, Pennsylvania. This park is home to many beautiful waterfalls, some of which are hidden in the woods. The two listed on the park map, Buttermilk Falls and Lukes Falls, are located in the center of the park and easily accessed along the D&L Trail. 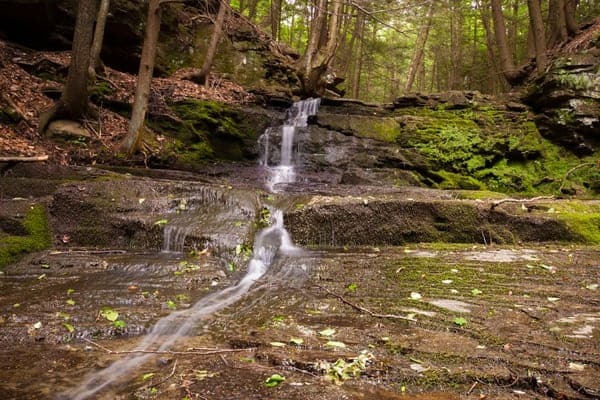 The park is also the access point for the fantastic Glen Onoko, one of the best waterfall destinations in Pennsylvania. While these waterfalls are located on state game lands and not within the park, the trail starts in the park, which is why I thought it was worth mentioning them here. 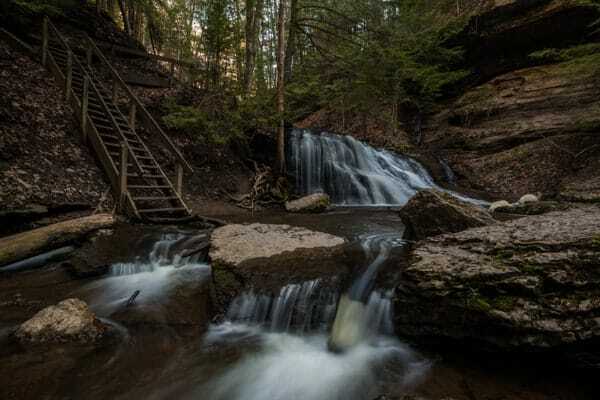 For more information, check out our article on Buttermilk Falls and Lukes Falls and our article on hiking Glen Onoko. 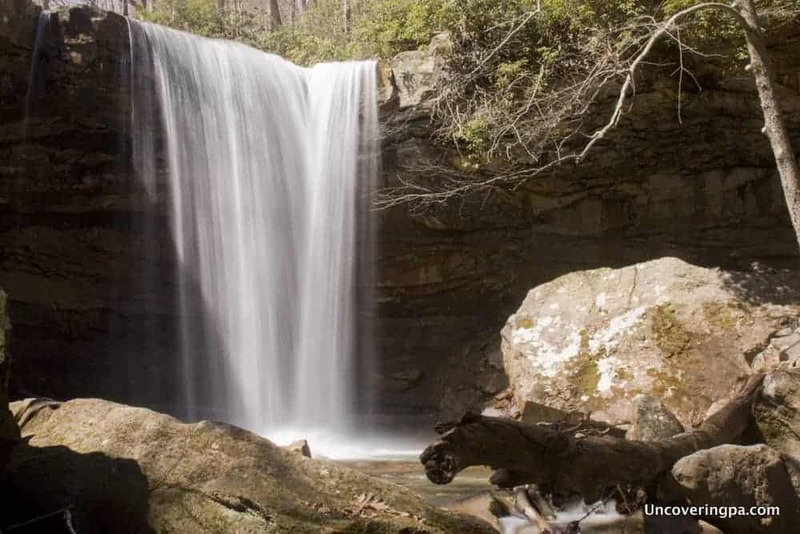 Cucumber Falls in Ohiopyle State Park is one of the most beautiful waterfalls in Pennsylvania. Southwestern Pennsylvania’s Ohiopyle State Park is one of the most beautiful parks in Pennsylvania. It’s also home to several incredibly scenic and impressive waterfalls. The most well known is Ohiopyle Falls, which spans the Youghiogheny River and is one of Pennsylvania’s most powerful waterfalls. 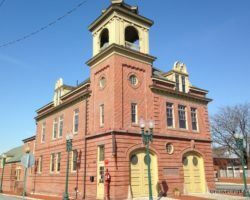 It also has an interesting connection to the history of the United States. The second most well-known waterfall in the park is Cucumber Falls. One of my favorite waterfalls in Pennsylvania, the water here falls roughly 30 feet over a ledge to the rocks below. Other great waterfalls in the park include two on Jonathan Run, the fantastic Cascades, Sugar Run Falls, and many other hidden waterfalls. For more information, check out my information about the waterfalls of Ohiopyle State Park. The middle of three waterfalls located in Salt Spring State Park. 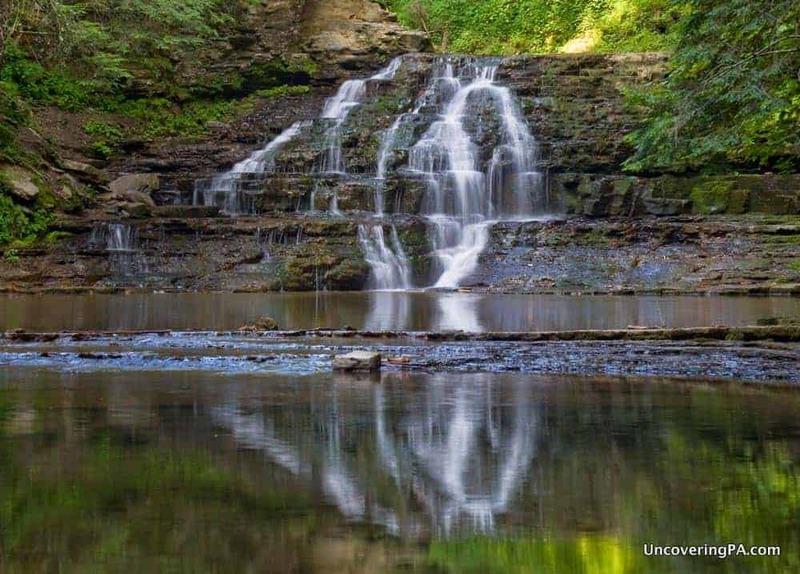 Salt Springs State Park in northern PA’s Susquehanna County is an often overlooked park. 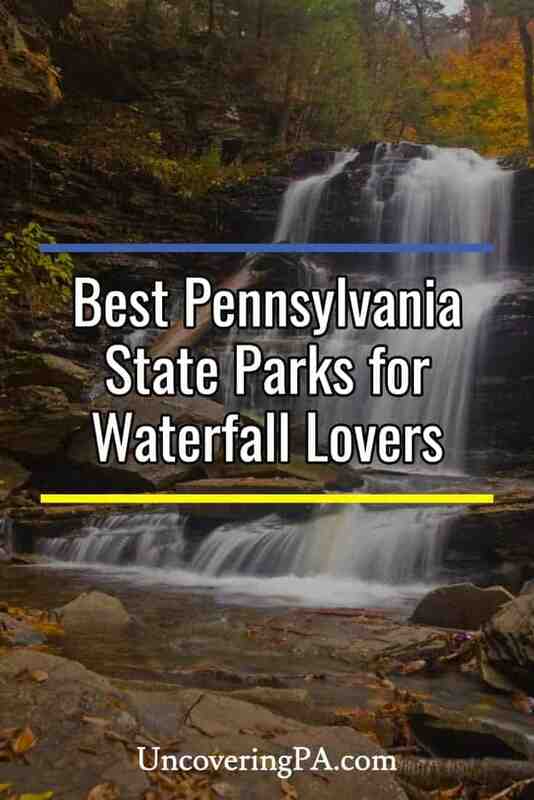 However, people looking for the best Pennsylvania state parks for waterfalls won’t want to miss this hidden gem. That’s because Salt Springs State Park is home to three beautiful waterfalls. All three falls are located along Fall Brook and can be seen from both the Fall Brook Trail and the Hemlock Trail. While the Hemlock Trail follows the ridgeline and offers views of the falls from a distance, the Fall Brook Trail travels directly along the banks of the creek, often necessitating getting your feet wet to head upstream. For more information, check out our article about hiking to the waterfalls of Salt Springs State Park. Miller Falls is one of several beautiful waterfalls in Oil Creek State Park. 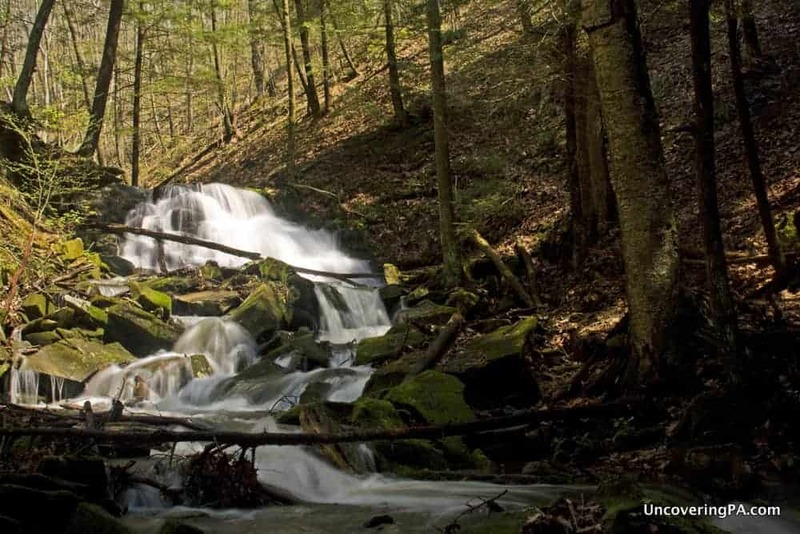 Oil Creek State Park in northwestern Pennsylvania is more known for its world-changing history than its waterfalls. Still the park is home to several great waterfalls that are worth seeing. Waterfalls like Boughton Falls, Pioneer Falls, and Plum Dungeon Falls are hidden away deep in the park. 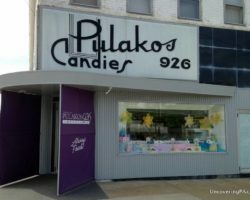 However, Miller Falls is located just a short distance from a parking area. This waterfall is located near some rusting pieces remaining from the park’s oil boom, but cascades beautifully down the hillside. 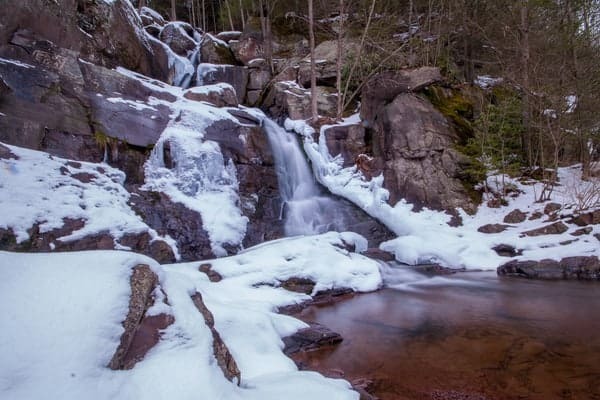 For more information, check out our article on Miller Falls and look at the park’s website for more information on the location of the park’s other falls. Prompton State Park is another park that doesn’t attract many visitors. However, the northwestern corner of this state park is a great destination for waterfall fans. Here a series of drops along a seemingly unnamed tributary of the Lackawaxen River tumble down the hillside. The beauty here is that you won’t have to worry about competing with a ton of other people, as the northern section of Prompton State Park sees very few visitors. For more information about hiking here, check out our article on the waterfalls of Prompton State Park. I think Aycriggs Falls in Swatara State Park. If you want a photo, let me know. Meant to say “I think you missed” Aycriggs Falls …..
I’ve been there, and it’s a great spot when it’s flowing. As I said, this isn’t a list of all of the state parks with waterfalls, just the best few, in my opinion. There are a good number of state parks with waterfalls that I didn’t include. these state parks should give a 40 % disc for the MILITARY………yes. There is no charge for anyone to visit a Pennsylvania state park.